I was filling my water bottle up at work and suddenly, I looked up and realized this work of art looked familiar. See the resemblance to Trump? Maybe it's just me. Love library dates with my husband! I picked up this book and it's great! 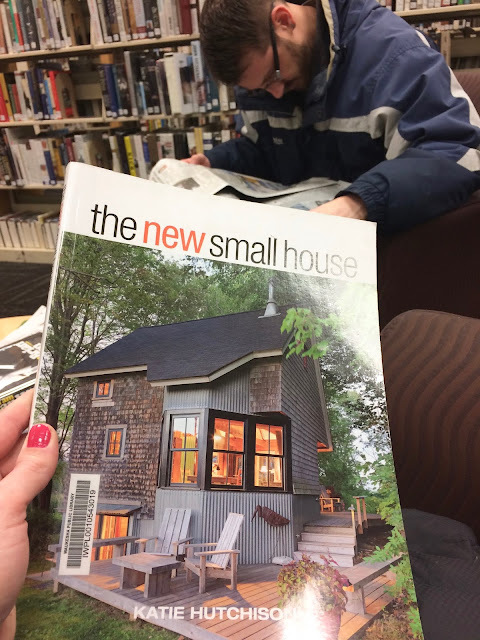 I want the house on the cover. Maybe we'll retire in a tiny home. The rest of this post might as well be called "what I ate last week" because it's mainly about food! 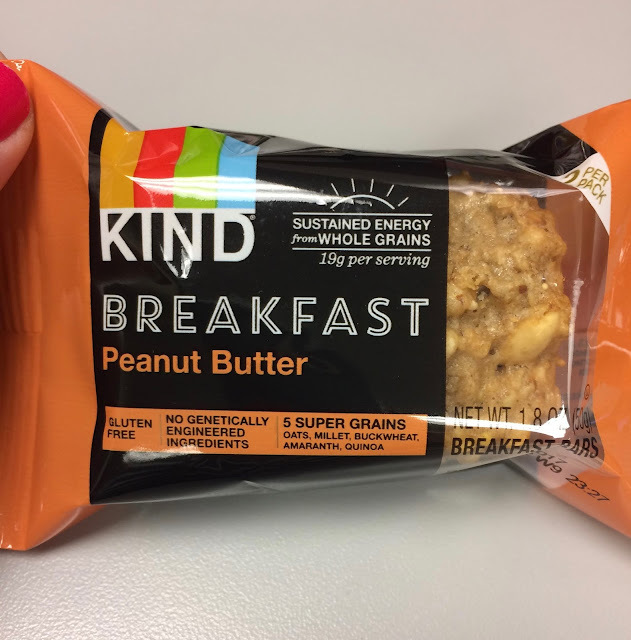 I was craving peanut butter last week so these hit the spot. 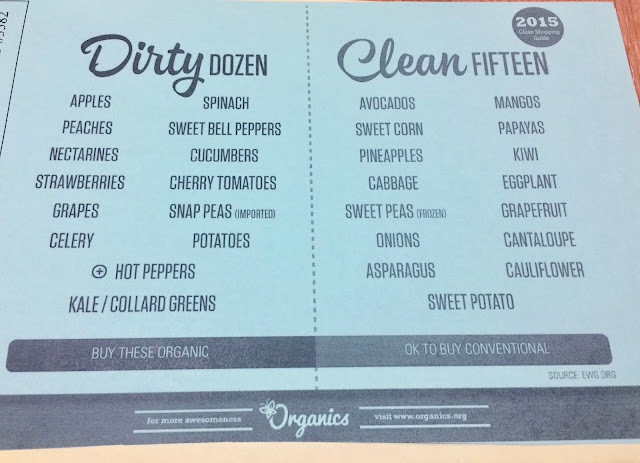 I went to a great program on "food as medicine" and the speakers handed out this sheet. 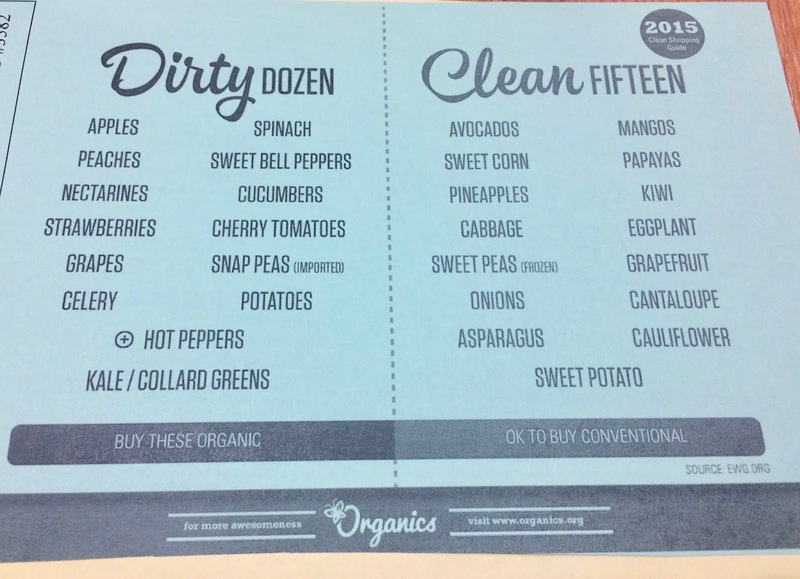 I always love to have a reminder of what to try to buy organic. Besides peanut butter, I was also craving chocolate last week. These are so good! 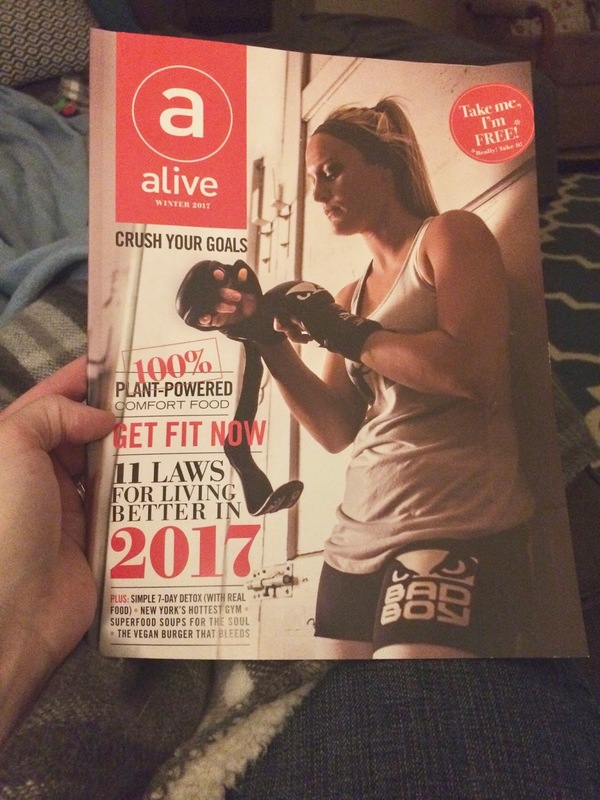 Picked up this free magazine at the grocery store and it's full of really good content. This was just meh. I was desperate since I craved hot chocolate and we didn't have any in the house. Um, did I mention I was craving peanut butter and chocolate? So I made peanut butter oat balls and took them to work to have as dessert or as a snack. I just mixed up PB, chocolate chips, quick oats, honey, and chia seeds. Pema really loved the peanut butter too. I allowed him one tiny lick. Craig worked three sixteen plus hour days in a row and my sleep also suffered. I was so glad I picked this up at Trader Joe's on Friday night because I needed it very badly on Saturday morning. I sipped it in the car as I drove to meet a friend for lunch. After a delicious lunch at an Indian buffet, my friend and I checked out the land she's building on and then the model of her new house. Her model was in the Parade of Homes a couple of years ago and both of us loved it. I could have pictured Craig and I living there too. I'm so glad her and her family will move into a beautiful new home come summer. And then we headed to the outlet mall! Per usual, she picked up a few things and I found nothing except something to drink. Surprise, surprise, it was a hot chocolate! I ordered a hazelnut flavored one. 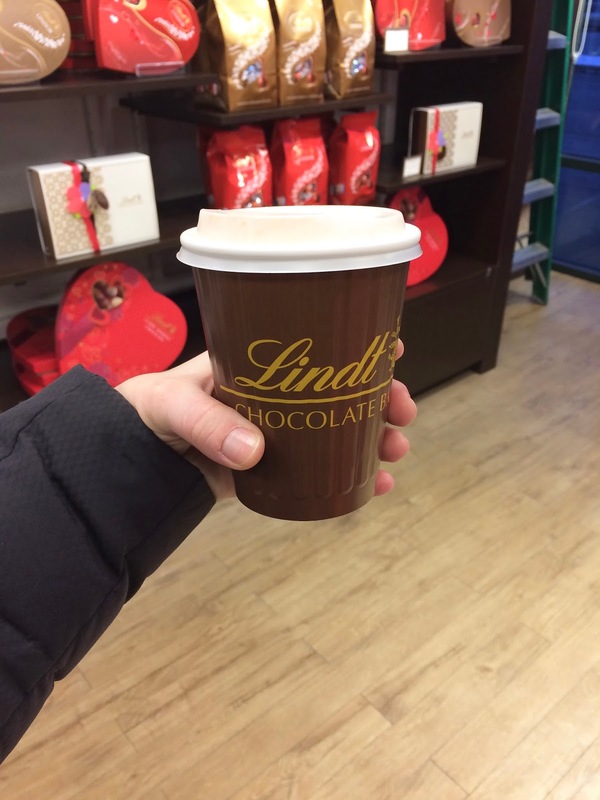 Did you know that you can order a Lindt hot chocolate with any flavor truffle found in the store? It was delicious, of course! Started my Monday morning by getting to work at 6:30 to avoid an ice storm and work some overtime. My job requires a quiet office to accomplish most of my tasks well. Luckily, I am a total morning person, while my other colleagues are not. I took a little walk through the new gallery show we have on display. I love the artist's work, especially because I am a bird lover. This one also has such a beautiful frame! I finished reading my third book of the year, Paulo Coelho's The Spy. It was sort of meh. Mata Hari's life was fascinating and sad though. And onto a new book (well actually two because another one came in via the digital library). I really like this one so far. Set some new goals using the Fitbit prompt to change some things up for the new year. Unfortunately, some of those goals may have been ignored a bit because I ate so much this week, including the delicious homemade cake a colleague brought in. 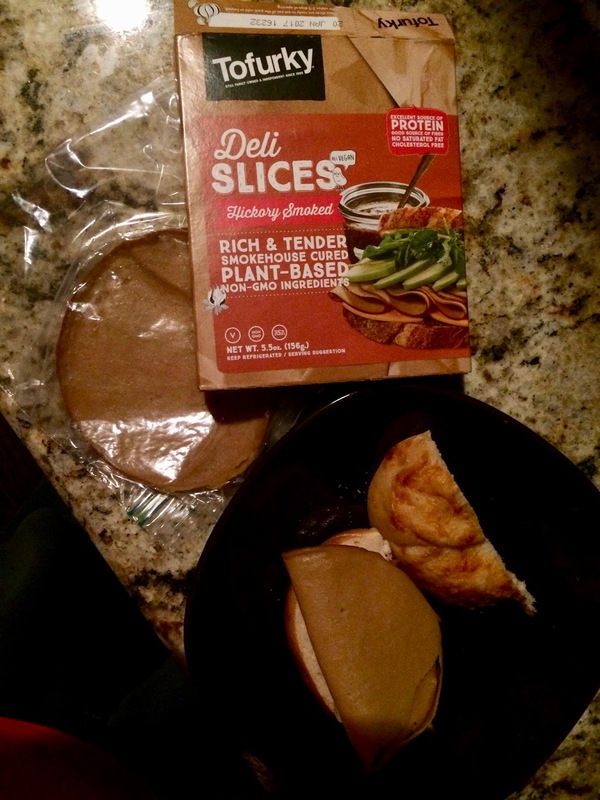 These Tofurky slices are pretty good, although Rip Esselstyn specifically says not to consume these on his seven day diet. We actually bought them for Craig, so it's ok that I've had a couple of slices. 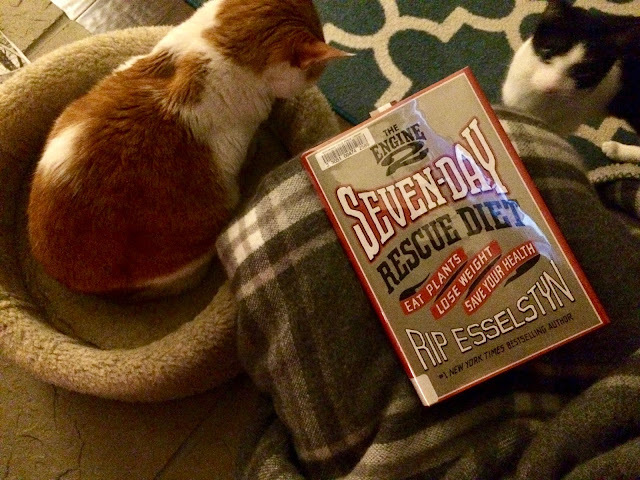 The cats (well maybe except Pema) continue to adhere to their nightly routines. For Shiva, that means following me up to the bedroom and lying down outside the door. 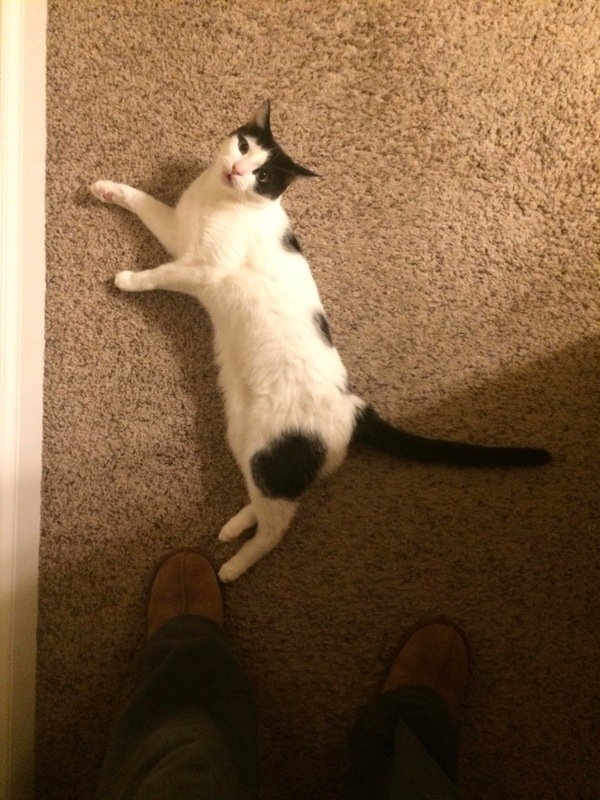 Tanzi runs up the bathroom and waits for Craig to pet him using a tweezers. That old kitty loves hard scratches! Shiva has now joined the party. 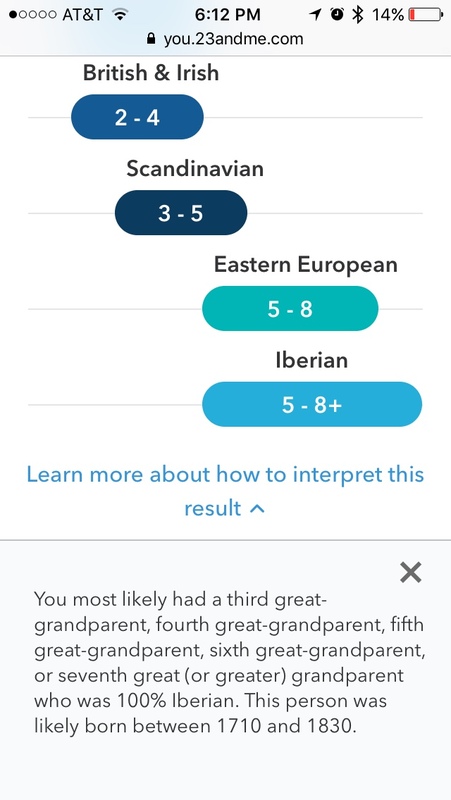 Loving this new feature on 23andme. 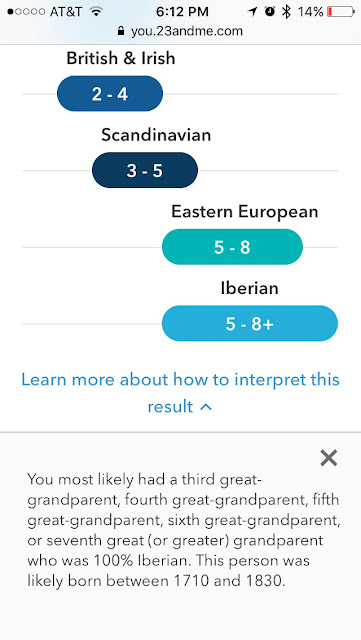 I still am struggling to find which of my ancestors would have been from Spain or Portugal. Maybe the information from this report will help me. We showered my sister-in-law (also named Lisa) with love on Saturday! She's due in early April, which will be here before she knows it. I love looking at old photos of my husband when we're at their house. He looks so adorable here. My sister was in town over the weekend and a bunch of my family met up to catch up with her! Here's my great niece who cries every time she sees my brother, her grandpa! He is quite the bugger and always has been, so I think she has a sixth sense. And here's my nephew Nathan showing off his snacks. Off to watch Victoria! I really enjoyed last week's episode. Are you watching it? Week 2 was a good one! I made overnight oats with organic frozen raspberries (they're finally back in stock at Costco) and goji berries. Such a good combination! 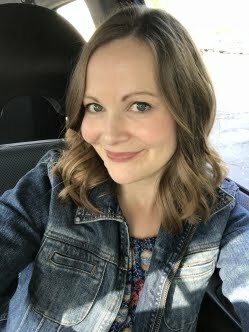 I finally got a haircut! Last time I had one was in September and I needed it refreshed so badly. I still cannot manage to get my hair to curl as well as my stylist does. We went to Illinois on Saturday. I enjoyed a delicious Earl Grey vanilla creme latte from Argo Tea. We don't have any Argos in our area, so I always like to head there when we go to Chicago. 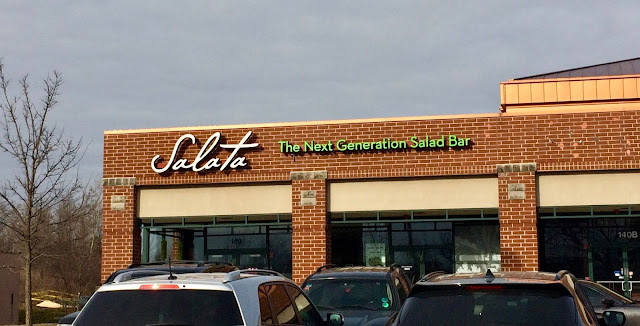 On our way to Woodfield Mall, we passed up Salata and I figured that might be a great place for us to have lunch later on. Once we did some research on lunch spots in the area, Salata sounded perfect for a vegetarian and a pescatarian who is a bit picky (Craig). 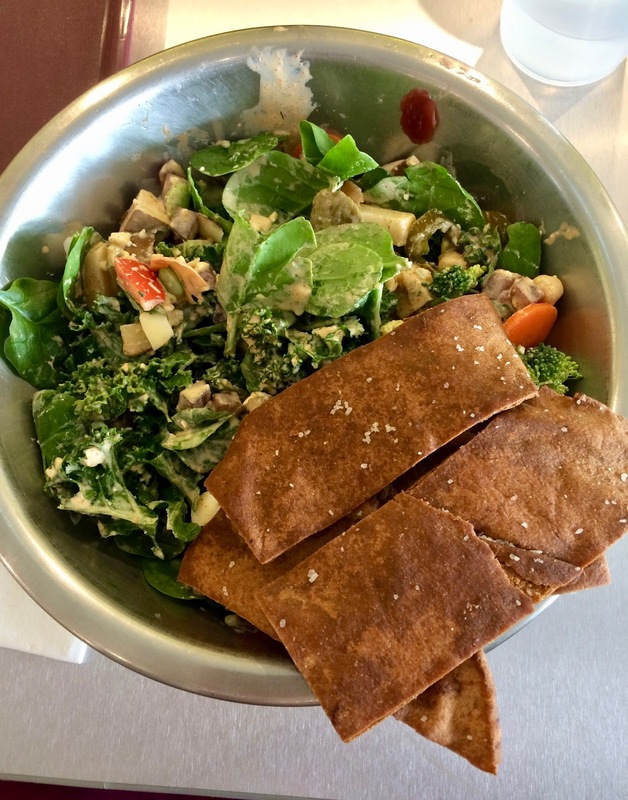 You can make a salad or wrap and choose from so many different toppings! 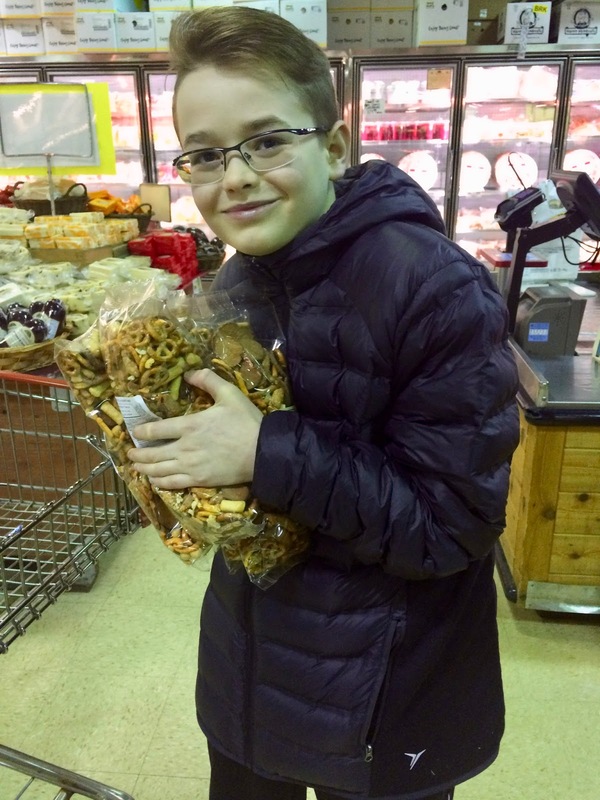 Loved their mission statement of "eat good, look good, feel good." We both LOVED our salads! The salad dressing we chose was Spicy Chipotle Ranch and it was amazing. I had a bit of everything in mine and tried to add things I don't normally have in stock at home, like beets. I chose some pita chips as my bread and added baked tofu as protein. We both really wish there was a Salata in the Milwaukee area. I'll be dreaming about that salad for the next month or trying to recreate it at home. After lunch, we headed to IKEA. It was packed and we did not find much. We will likely invest in some more expensive furniture pieces vs. buying stuff that might fall apart pretty quickly. Craig and I did buy some CD/DVD storage shelves and when he put one together today, the back panel piece broke in half. I'm crossing my fingers that IKEA customer service comes through because we're not keen on making another four hour round-trip drive to the nearest location. I tried this brand of pickles for the first time today! The company had sent me some coupons a long time ago and I finally found them at Target. Loved these because they were a bit spicy! Not too much else to report about this week except that I finished the book Miss Jane and enjoyed it! Onto The Spy by Paulo Coelho next. Time to start 2017 with a fresh start! The new year is a time for cleaning and organizing, and it’s also the perfect opportunity to make some changes to your cleaning routine. This cleaning caddy makes it easy to keep everything in one place! It’s the perfect mix of farmhouse chic and functionality. Plus, it’s actually enamel — not plastic — so I know it’ll last me a long time. I put all my sprays and cleaners in the caddy and hung my brushes by the handle over the side so they could dry. If you’re looking for easy ways to green up your cleaning kit, the caddy actually comes with a few supplies to get you started. 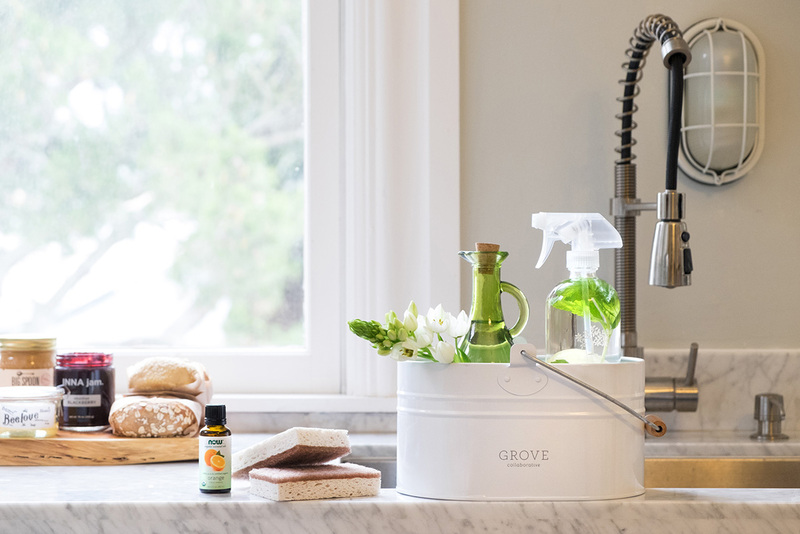 The glass spray bottle is one of my favorite products from Grove Collaborative. I use it to mix up homemade cleaners, essential oil room sprays, or storebought concentrates. They feel much more solid than plastic spray bottles, plus my kit looks so streamlined with this beautiful bottle. The kit also comes with a set of Grove Collaborative walnut scrubber sponges. They’re the only sponges I’ve found that don’t stink! I keep them in my cleaning kit because they’re perfect for scrubbing sinks and grout, but they work equally well in the kitchen. When they need refreshing, I just put a drop of the Now orange essential oil on them and toss in the dishwasher. They come out smelling fresh and clean! My subscription to Grove Collaborative has made my life much more organized. Instead of running to the store for household supplies, I get a box of my favorite natural products delivered right to my doorstep on my schedule. Because Grove remembers my preferences and recommends products I might be running low on, I never run out of household essentials. The shipments are totally customizable, so I only get what I need, when I need it. It’s one less thing I have to think about! 1. Sign up for Grove Collaborative here. You will receive the Grove Collaborative cleaning caddy for free when you sign up! Existing customers will receive free Grove Walnut Scrubber Sponges with your next order. 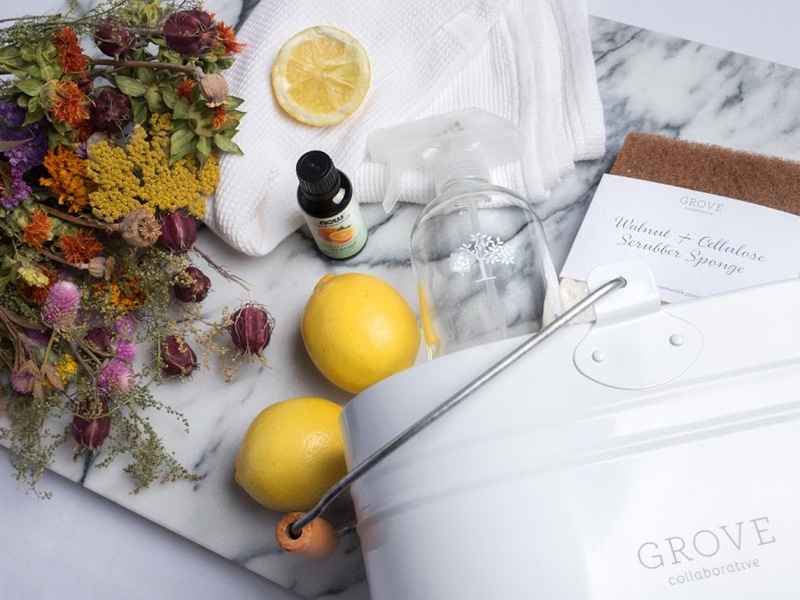 Tip to save: Once you’ve submitted your Grove order, you’ll be signed up for the free 60 day VIP trial. As a VIP, you’ll get free shipping, free gifts, price matching, exclusive sales and personal service. It’s a great way to get to know Grove and discover some new products! 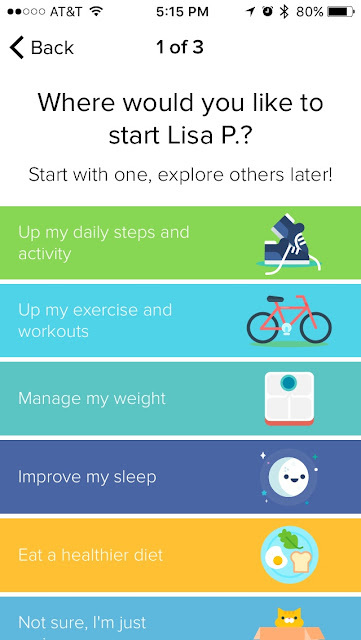 Here is what my everyday life looked like during this first week of the year! I've been learning French via Duolingo and enjoying it! If we go to France this year, I won't feel so lost. I am reading this book and like it so far, which is a relief since I had started two other books earlier this week and they were duds. I love the book cover! 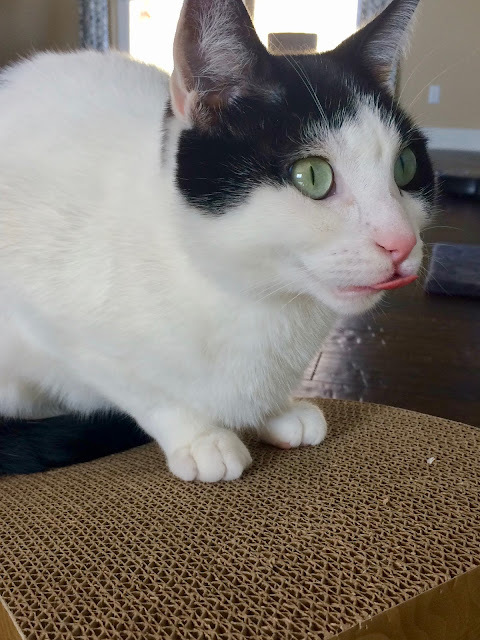 Caught my little Shiva with his tongue out! I met a former colleague for lunch at Urban Beets on Saturday and we had a delicious meal! I got the Vegan Reuben sandwich and a Tummy Tamer green juice. After lunch, I ran to Boswell Books to use up two gift cards that I have had for over a year. One of my goals is to cook more this year, so I finally decided to invest in Minimalist Baker's cookbook. 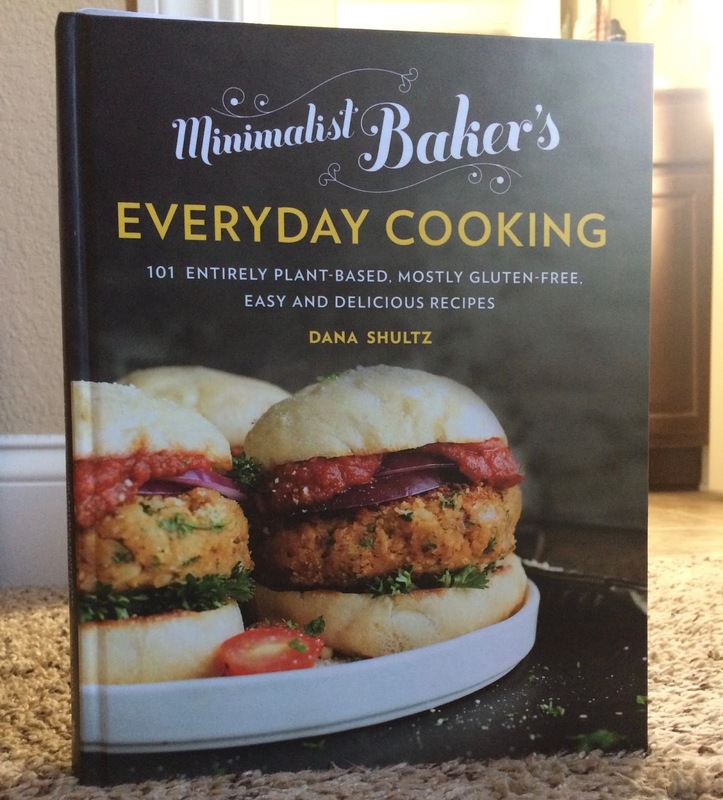 I have a fair number of cookbooks already, but want to make more plant-based and gluten-free recipes. 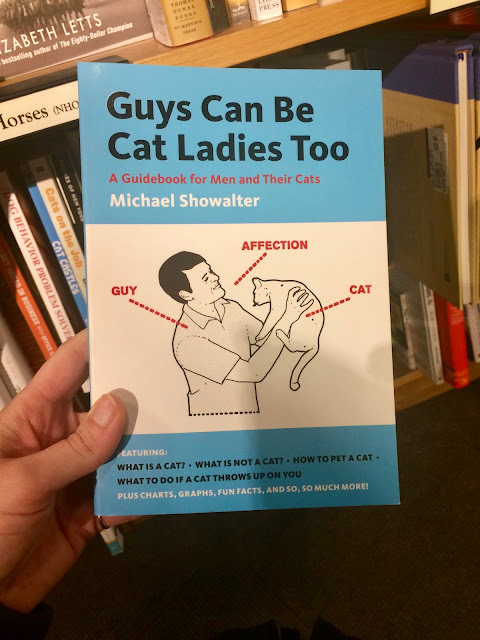 I sent a photo of this book to Craig while I was at the bookstore. I glanced through it and found it to be really funny! It would make a great gag gift. 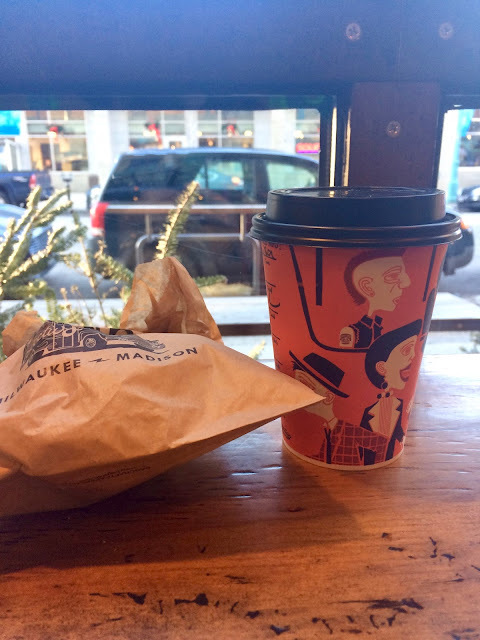 I escaped the frigid temps by getting a latte and raspberry scone at Collectivo! Pema being silly, as always. 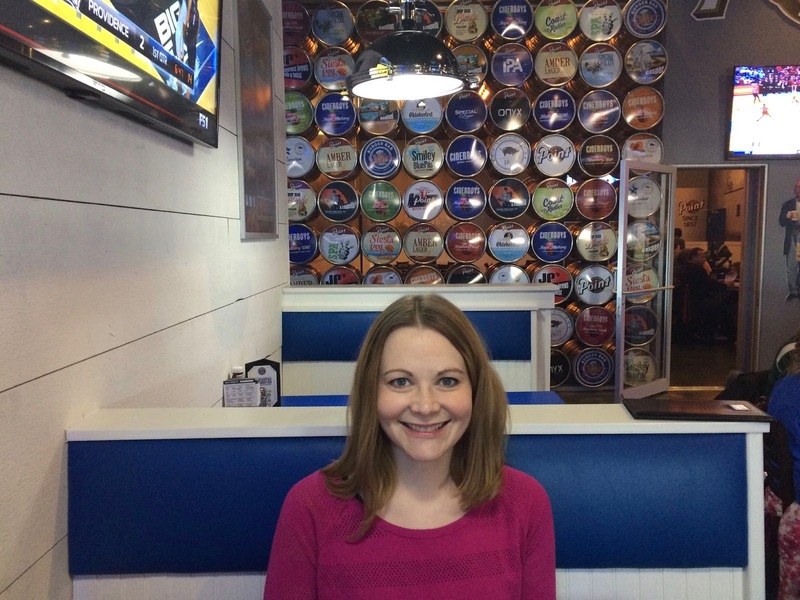 We went furniture shopping this afternoon and then checked out the new Point Burger Bar for lunch. Ugh, it is time for a haircut. My hair is just blah lately and I am so glad I booked an appointment for this week. 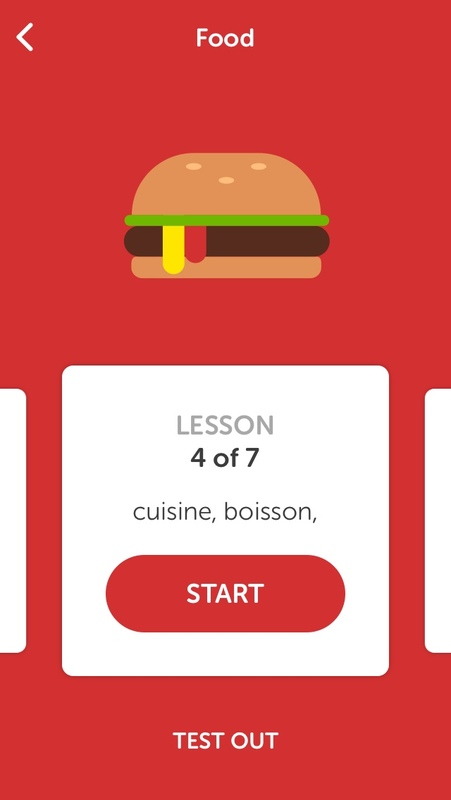 We liked being able to build our own burgers and check off the various toppings on a card. We both ordered veggie burgers on pretzel rolls and they were yummy! There is a go-kart place attached to the restaurant, so we walked over there to check that out. It looked like a fun winter activity!